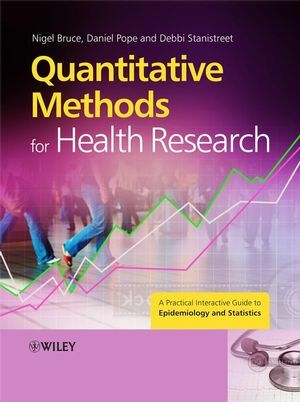 Quantitative Research Methods for Health Professionals: A Practical Interactive Course is a superb introduction to epidemiology, biostatistics, and research methodology for the whole health care community. Drawing examples from a wide range of health research, this practical handbook covers important contemporary health research methods such as survival analysis, Cox regression, and meta-analysis, the understanding of which go beyond introductory concepts. The book includes self-assessment exercises throughout to help students explore and reflect on their understanding and a clear distinction is made between a) knowledge and concepts that all students should ensure they understand and b) those that can be pursued by students who wish to do so. The authors incorporate a program of practical exercises in SPSS using a prepared data set that helps to consolidate the theory and develop skills and confidence in data handling, analysis and interpretation. 1. Philosophy of science and introduction to epidemiology. 1.1 Approaches to scientific research. 1.2 Formulating a research question. 1.3 Rates: incidence and prevalence. 1.5 Answers to self-assessment exercises. 2. Routine data sources and descriptive epidemiology. 2.1 Routine collection of health information. 2.3 Information on the environment. 2.4 Displaying, describing and presenting data. 2.5 Summary of routinely available data. 2.6 Descriptive epidemiology in action. 2.7 Overview of epidemiological study designs. 2.8 Answers to self-assessment exercises. 3.1 Health inequalities in Merseyside. 3.2 Indirect standardisation: calculation of the standardised mortality ratio (SMR). 3.4 Standardisation for factors other than age. 3.5 Answers to self-assessment exercises. 4.4 Sampling error, confidence intervals and sample size . 4.7 Data types and presentation. 4.8 Answers to self-assessment exercises. 5.1 Why do a cohort study?. 5.5 Basic presentation and analysis of results. 5.6 How large should a cohort study be?. 5.9 Introduction to multiple linear regression. 5.10 Answers to self-assessment exercises. 6.1 Why do a case-control study?. 6.2 Key elements of study design. 6.3 Basic unmatched and matched analysis. 6.4 Sample size for a case-control study. 6.5 Confounding and logistic regression. 6.6 Answers to self-assessment exercises. 7.1 Why do an intervention study?. 7.2 Key elements of intervention study design. 7.3 The analysis of intervention studies. 7.4 Testing more complex interventions. 7.5 How big should the trial be?. 7.6 Further aspects of intervention study design and analysis. 7.7 Answers to self-assessment exercises. 8. Life tables, survival analysis and Cox regression. 8.4 Answers to self-assessment exercises. 9. Systematic reviews and meta analysis. 9.1 The why and how of systematic reviews. 9.2 The methodology of meta-analysis. 9.3 Systematic reviews and meta-analyses of observational studies. 9.5 Answers to self-assessment exercises. 10. Prevention strategies and evaluation of screening . 10.3 Evaluation of screening programmes. 10.4 Cohort and period effects. 10.5 Answers to self-assessment exercises. 11. Probability distributions, hypothesis testing and Bayesian methods. 11.2 Data that do not ‘fit’ a probability distribution. 11.4 Choosing an appropriate hypothesis test. 11.6 Answers to self-assessment exercises.